BC&A developed the design and is currently providing construction management for the Southwest Aqueduct Reach 1 Project (SWA-1). The design of the SWA-1 project included the evaluation of a new 66-inch Aqueduct that will parallel the existing 78-inch Jordan Aqueduct Reach 1. The design also included an alignment study, a geotechnical investigation, a hydraulic evaluation of multiple operational scenarios, a pipeline material evaluation, a corrosion protection study resulting in a cathodic protection design, an analysis of relocating a section of the Jordan Aqueduct to accommodate the SWA-1, a utility search and potholing, and permitting review that was documented in a preliminary design report. To provide JVWCD with additional raw water supply capacity for the JVWTP and to provide redundancy to the ageing Jordan Aqueduct, the project included over 11,000 LF of 66-inch WSP pipe for the new SWA-1 and segments of new 78-inch and 90-inch pipe to replace existing raw water supply pipelines. The project included four control vault structures, a standpipe, flow control, and modifications to the Jordan Narrows pump station. 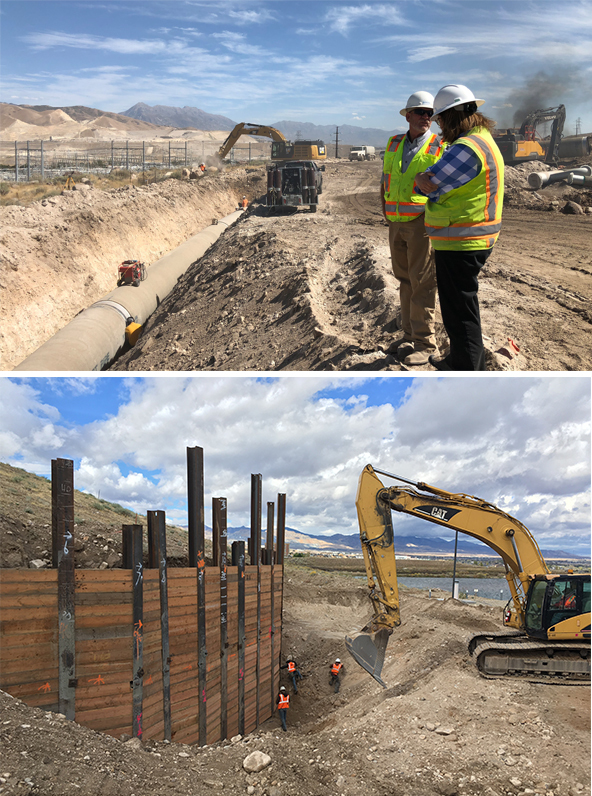 The SWA-1 is being constructed alongside the Jordan Aqueduct at a safe offset distance that will allow the existing pipe to remain in operation during SWA-1 mainline construction. At the interconnection valve vault structure the vault has been designed to enable future 78-inch gate valves to be easily added to the Jordan Aqueduct. With this design the valves can be added to the Jordan Aqueduct with minimal future operational impacts to reduce the overall future costs of a Jordan Aqueduct valve project.